The initial portion of the Mainland Trail at Owen Sowerwine is a 4-foot wide, roughly 700 feet long, accessible trail leading to a 10’x10’ accessible viewing area on the banks of an overflow wetland off the Stillwater River. The trail begins at the wheelchair-accessible gate located at the Treasure Lane entrance. 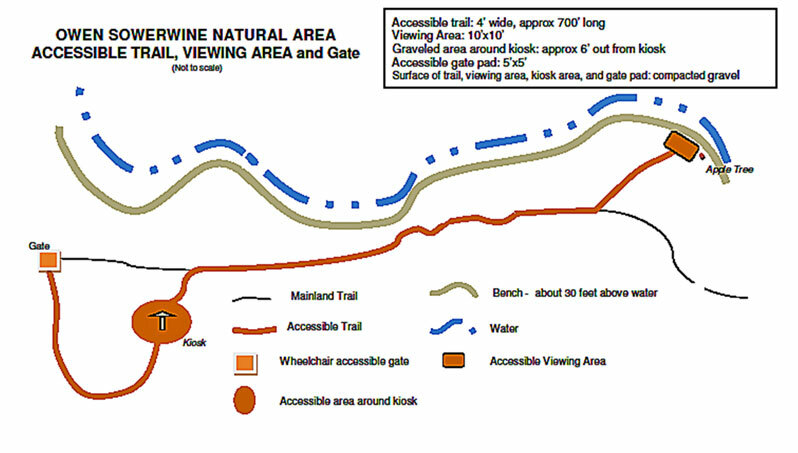 The gate pad, accessible trail, and viewing area are level side-to-side and hard-surfaced with firmly tamped gravel. The trail route is mostly flat, with two short inclines that meet ADA standards. Along the way, the trail passes an informational kiosk that, among other things, displays a large map of the Area and a list of over 120 bird species present here. The viewing area overlooks quiet water and floating waterfowl in one direction, and an often bird-filled meadow in the other. The OSNA Accessibility Project was a collaborative effort. The Project was planned and carried out by Flathead Audubon’s 10-member Owen Sowerwine Committee. Committee members began researching the requirements of accessibility in the outdoor setting in May 2011. They were aided in this by a local Flathead Forest trail designer. A site-specific detailed plan was developed in consultation with outdoors recreation advisors from UM’s MonTech program. Committee member Lewis Young designed the wheelchair accessible gate. As part of the October 2011 OSNA workday, volunteers removed brush, cleared the initial portion of the old Mainland Trail, and opened up a new switchback in order to reduce an existing incline that did not meet ADA standards. Workers also cleared spaces for the new accessible viewing area and a new gate pad. The trail and viewing area were constructed the following spring by Montana Made Trails, owned and operated by Darren Pfeifle, with the assistance of Audubon volunteers. Richard Kuhl, Susannah Casey, Neal Brown and Rod McIver helped with shovel and rake work. Lewis Young and Brent Mitchell installed the wheelchair accessible gate. Generous financial help came from a variety of local businesses. Flathead Electric Coop awarded Flathead Audubon a Round-up-for-Safety Grant that would cover much of Darren’s trail-building fee. We turned to other local businesses for help – and encountered great generosity. LHC Inc., Sliters Lumber and Building Supply, Murdoch’s Farm and Ranch Supply, and Midway Rental all provided sizable contributions to the Project. Flathead Audubon and Montana Audubon covered the remaining Project costs. Additional support came from the Flathead County Roads Department and the Flathead County Commissioners. The Roads Department gave advice on leveling and gravelling the parking area outside the main entrance and issued a permit for this work. The Commissioners endorsed the permit and encouraged the Project. The accessible portion of OSNA was officially opened on June 15, 2012. About forty people gathered at Owen Sowerwine to celebrate the opening – Flathead Audubon members, some with their children, a representative of Montana Audubon, local business owners, local and state government officials, and the trail-builder, accompanied by his proud little boy.